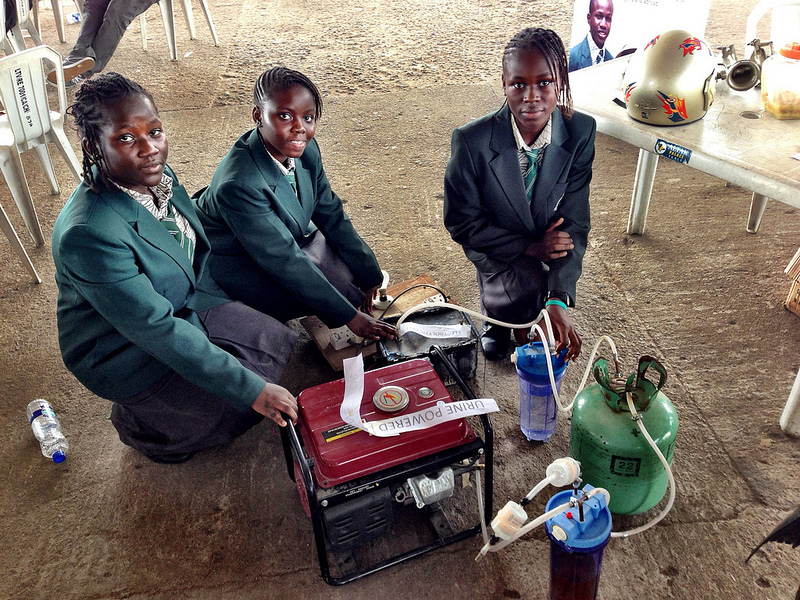 Four Nigerian girls have invented an engine that runs on a truly renewable resource: human urine. The students Duro-Aina Adebola (14), Akindele Abiola (14), Faleke Oluwatoyin (14; from left) and Bello Eniola (15) presented their engine at this year’s Maker Fair Africa conference in Lagos. One liter of urine (about half what a person produces per day) can generate up to six hours of electricity. 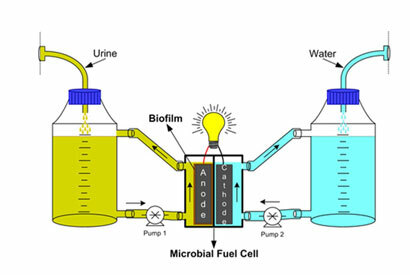 The process works by separating the hydrogen out of the urine, and then using it to power the generator. Urine is put into an electrolytic cell, which separates out the hydrogen. The hydrogen goes into a water filter for purification, which then gets pushed into the gas cylinder. The gas cylinder pushes hydrogen into a cylinder of liquid borax, which is used to remove the moisture from the hydrogen gas. This purified hydrogen gas is pushed into the generator. The urine powered engine is no perpetual motion machine, though. The separating of the hydrogen from the urine requires a source of electricity – quite a bit of it actually. While the ammonia and urea in urine make it easier to separate the hydrogen than it is to separate hydrogen from water the girls’ generator still requires a large power input to work in the first place which so far makes it not seem lucrative enough for mass application in private bath rooms. Still, even more established scientists are pursuing urine as a power source.